Will you pull for Jon Gruden to win? His face will contort the same way as ever. His sound bites will sound as good. He will pump is fist in victory the way he used to. But will you pull for Jon Gruden, the guy who used to work here? A continent away, will you pull for him to succeed? love for Oakland, and he's going to try to prove that he can be a builder after all. He will try to make you forget about his inflated contract with the substance of a coach. And how will you feel about it? Will you smile when he wins? Or will you shake your head at the coach who got away? Gruden was introduced as the Raiders' coach Tuesday. It took a long time, I guess, because there were so many zeroes in his contract. And you wonder what the real story was in Tampa Bay: Did the Glazers flirt with him only to be driven off by his price tag? And will you be sorry if Gruden goes 11-5 next year and the Bucs go 7-9? It's a complicated situation. A lot of Gruden's fans these days have never seen him coach, and certainly, they haven't seen him win a playoff game. It's been a decade since he wandered a sideline, a decade-and-a-half since his Super Bowl win. A lot of fans are unaware that he never developed a young quarterback here; it is television that constructed his reputation as a guru for them. Money aside, this is a risk. In coaching, they keep score. It isn't TV where publicists send out our your sound bites. In this profession, you win or you lose. As a lot of you know, I criticized Gruden. (I criticized Tony Dungy, too). It came with the position. But in the year he was fired, I did not call for his head. I thought that team had 6-10 talent and he coached it to 9-7. 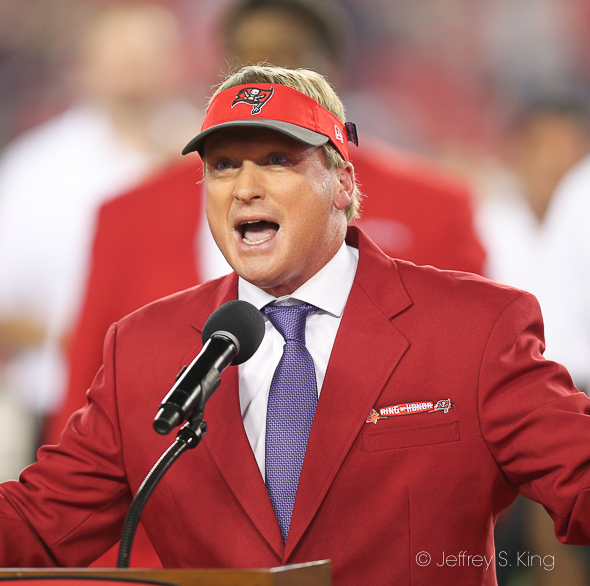 But, yeah, in the years that the Bucs were bad under Gruden, I suggested they were bad. And they were. Gruden had a horrible general manager in Bruce Allen, and the Bucs didn't replace great players at the rate they were losing them, and the franchise was running in place. Gruden was a good enough coach to keep the Bucs around .500, but he wasn't good enough to overcome a shortness of talent. A story: One year, when Gruden started off 0-4, I wrote a column that stated, simply, that it wasn't working with Allen and Gruden. I wondered if Gruden drove to the stadium and wondered why it had all slipped away. Lo and behold, the Bucs won that day. In the locker room, after the game, one of Gruden's errand guys came up behind me and clapped me on the back. "I read what you wrote this morning," he bellowed. "It was lies," he screamed. "Lies. It was nothing but lies." And, for once, I stayed calm. I looked at him and said simply, "I thought I got the part right about oh-and-four." The thing is, I liked Gruden. I really did. He was funny, and he could fill up a notebook. But a bad record is a bad record, and Michael Clayton was Michael Clayton and Dexter Jackson was Dexter Jackson and Bruce Gradkowski was Bruce Gradkowski. There was a reason that Gruden was 45-51 after his first. year. Oh, but what a first year it was. I've written it before but I don't think a coach ever had a first. year like Gruden. He went from a guy who mispronounced the names of his players to someone who provided the energy to win a Super Bowl. And, yes, it was his Super Bowl. There has been a lot of debate about that year and whether it belonged to Gruden or Dungy. And most of you know that I'm a huge Dungy guy. But when a coach takes over a team, and he runs it every day, it becomes his team. Dungy has said as much himself. Dungy built that era, but Gruden was in charge for the Super Bowl. Now, he is chasing another one. Here's a question I've been asking: For $100 million, how many Super Bowls does he have to win before he's a bargain? Two? Four? How many years does he have to last? Six? Eight? I know this: The NFL is better with Gruden on the sideline. It doesn't matter if the thought of him winning makes you ill, or if it fills you with joy. Gruden is a strong taste. He'll make the Raiders lovable again, and he'll make them hateable. And so will you cheer? Will you take joy in his shortcomings? Will. you take interest in his defensive coordinator? Will you laugh if he's unhappy with his quarterback? One thing seems certain: You won't ignore him. Whether Gruden was 12-4 or 4-12, you never could. I always thought Mark Davis looked like one of the characters on the movie Dumb and Dumber. With Gruden’s $100 mil contract, I’m certain Davis was indeed portrayed. Ha. that’s funny. G’day mate. I have just listened to the entire 33 minutes and 31 seconds of Jon Gruden’s 1/9/2018 press conference posted at http://www.nfl.com/videos/oakland-raiders/0ap3000000904829/Jon-Gruden-s-full-introductory-press-conference . The one question directed to him regarding Las Vegas he deferred to Mark Davis. It appears that Jon cares as much about Oakland as he does about the Raiders. Is he in denial that the team is moving to Las Vegas in 2020? Does he not understand that the reason Mark Davis can pay him $100 million is because the state of Nevada is contributing about $1 billion towards the cost of the new stadium, which thereby solidifies that state’s hold on 49th place in quality of its public education system? I think Gruden knows. He’s just playing to the fans. I’ll love forever…or until Im gone. What with Jon Gruden getting paid $10 million per year for 10 years, I have now given up all hope that Mark Davis will ever be able to afford to get a decent haircut. Why do you think they make bowls? The Moe look could come back. I think Gruden will win with the Raiders. I think he will put fannies in the seats which is why he is getting that fat contract. I think he will make the Raiders better especially in those first couple of years. And I don’t care how much money he makes. Will his ego get in the way after success like it did here? We will have to wait and see on that. Maybe he has learned from that experience. I’m pulling for him and hope to see him win a Super Bowl again. It’ll be interesting to see who he surrounds himself with. He wore the front office of the Bucs out.